Why farmers are growing cotton when water is scarce? YES, if the ‘whole lot of things’ were farmers wanting to form a band but a NO if it were racial conflicts and oppression faced by black cotton farmers in the late 19th and early 20th century. Frankly, I would have never thought that I could bring Jimi Hendrix and cotton under the same topic. But now that I’m doing it, one of the main reasons is cotton’s pervasiveness on a global scale. It’s a high risk, high value crop which has enticed millions of farmers across continents to chase it generation after generation. Naturally, it trickled its way into folklore and became an integral part of community culture. No wonder Lead Belly was singing about it back in 1940 (See “Cotton Fields”). Cotton is a water intensive crop that requires almost 75 lakh liters of water per hectare. That’s roughly 40,000 liters per day, considering a six month life cycle, i.e 4 tankers of water every day. For a water scarce region like Jalna, Maharashtra, that puts a lot of strain on the limited reserves of available groundwater. Naturally, one would think that farmers must stay away from cotton. But, an average farmer in the Bhokardan taluka devotes more than 60% of their land for cotton. It didn’t make any sense. So I started asking the WOTR staff, farmers, agronomists, para-agronomists, Vasundhara Sevaks – basically anyone who would entertain my incessant barrage of questions. 3 months into this, and I may have learnt something. 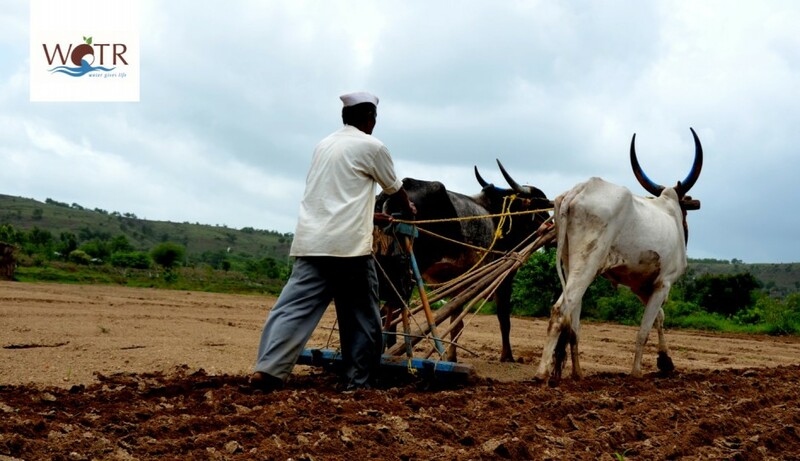 Before the changing climate started affecting the rainfall distribution in Marathwada, the farmers had a process to determine how much land would be utilized for sowing cotton. This involved checking the water levels in dugwells immediately after the first rainfall in June. The wells filling up indicate a great monsoon ahead and a majority of the available area can be planted. If wells are half-full or quarter-full the farmers decide on reducing their areas for sowing cotton. This used to be a surprisingly good estimate considering I can’t find any scientific evidence backing this. However, the recent change in rainfall patterns has wreaked havoc to this system. For example, this year was characterized by a decent amount of rainfall in June, which encouraged farmers to sow cotton in bulk. But July, August and nearly half of September was dry and the monsoon concluded with heavy rains in September end and early October. Naturally, most farmers were hit with lower production and poor quality of cotton with no water to spare. Considering the amount of fertilizer and pesticide investment that goes into cotton, most are barely looking to break even. Some of the hopeful farmers had not harvested their cotton until December wishing for either an increase in market price or a miraculous spurt of rain. Either way, the more time the cotton spends in the fields, farmers are burdened by additional cost of pesticides which needs to be administered without fail to prevent insect infestation. The problem with cotton is that it attracts a huge ensemble of insects and pests. The Bt cotton addresses this by genetically modifying the cotton to produce a toxin against the most common boll-worms and hence reducing pesticide usage. Monsanto introduced Bt-1 in India with resounding success of 95% cotton grown in India being genetically modified in 2014. However, there was a catch. The Bt cotton came with a specific set of instructions. It was imperative to use 20% of the sowing area to plant non-Bt cotton so as to prevent boll-worms from developing resistance to the Bt toxin. This practice is commonly known as ‘trap cropping’ where trap crops keep the pests from attacking the actual crops. Unfortunately, due to lack of awareness, the trap crop plantation never took off and inevitably boll-worms developed resistance to Bt-1. Monsanto then introduced Bt-2, now using a combination of toxins to prevent boll-worm infestation and making it imperative to use non-Bt cotton to use as traps. Not so surprisingly, even Bt-2 fell to boll-worm resistance for the same reasons. On asking the farmers why they didn’t use trap cropping, I found that they don’t want to lose out on the earnings from that 20% land area. But then, what about boll-worms? Just about a month back, I heard a general complaint among farmers that the government wasn’t releasing Bt-3 seeds into the market, and I really hope they don’t. It’s hard not to take sides in this debate. Ironically, here also, you reap what you sow! The debate between the responsibility of the government and that of the farmers enter murky grounds when you start considering the market forces. The global cotton prices are finely balanced between the worldwide demand and supply and competition from artificial alternatives. As a result, raw cotton prices vary greatly from year to year, ranging from a high of Rs. 7000 to a low of Rs. 4000 per quintal. Hence, the government regulates the price of cotton so that farmers are ensured a fixed rate for their produce. However, the absence of registered government dealerships in small talukas such as Bhokardan, forces the farmers of nearly 150 villages to sell to unregistered dealers at prices lower than the government stipulated price. This leads to farmers withholding their plucked cotton to wait for a rise in market price, which is risky because plucked cotton deteriorates quickly and warrants lower prices. However, keeping it in the fields requires additional pest control cost. As you would expect, this crazy trade-off keeps repeating itself every year. Cotton may be the ‘white gold’ as portrayed over decades. Out here though, it feels more like the ‘Mackenna’s Gold’. It’s mind-numbing to see the social dynamics and livelihoods of several generations linked to this feisty little crop. If only we could use Jimi’s electric guitar to straighten out this madness, we would be hitting people on their head with it. IANS. ‘Non-compliance of guidelines led to the resistance of cotton pest.‘ YourStory. June, 2017. Monsanto. ‘Pink Bollworm Resistance to GM Cotton in India’. April, 2017. Tabashnik, BE; Sisterson, MS; Ellsworth, PC; Dennehy, TJ; Antilla, L; Liesner, L; et al. (Dec 2010). “Suppressing resistance to Bt cotton with sterile insect releases”. Nat Biotechnol. 28 (12): 1304–7. Vandana, Dr. Shiva; Afsar H. Jafri (Winter 2004). “Failure of GMOs in India”. Research Foundation for Science, Technology and Ecology. P.S: the content of this blog has been shared from the India Fellow blog.